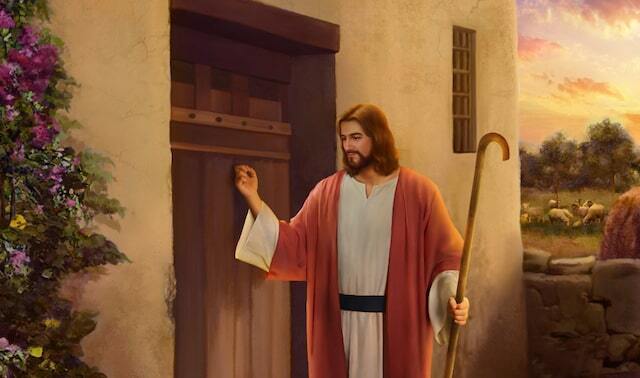 Home » The Gospel of Jesus Christ » Second Coming of Jesus Christ » The Lord Jesus Is Standing at the Door and How Can We Welcome Him? The Lord Jesus said: “Now learn a parable of the fig tree; When his branch is yet tender, and puts forth leaves, you know that summer is near: So likewise you, when you shall see all these things, know that it is near, even at the doors. Truly I say to you, This generation shall not pass, till all these things be fulfilled” (Matthew 24:32-34). We Christians all know that these are some scriptures prophesying about the return of the Lord Jesus. Here, that the fig tree’s branch is tender and puts forth leaves refers to the return of Israel, which is to say, when it returns, we will know that the Lord Jesus will come back soon. Now, the Israel has been recovered for decades, so this prophecy has already been fulfilled. The Lord Jesus also said: “But as the days of Noe were, so shall also the coming of the Son of man be. For as in the days that were before the flood they were eating and drinking, marrying and giving in marriage, until the day that Noe entered into the ark, And knew not until the flood came, and took them all away; so shall also the coming of the Son of man be. … Watch therefore: for you know not what hour your Lord does come” (Matthew 24:37-39, 42). “For nation shall rise against nation, and kingdom against kingdom: and there shall be famines, and pestilences, and earthquakes, in divers places. All these are the beginning of sorrows” (Matthew 24:7-8). We all know that in the time of Noah, people all strayed from God, did not worship Him, battled with each other and became ever more evil and debauched. They had been filthy and corrupt to such a point that it was unbearable for God to witness and finally were destroyed in the flood because of provoking God’s disposition. Look at the society now: People don’t worship the true God but worship false gods or evil spirits, compete for wealth and fame, fight both openly and in secret, and outwit each other—their evil and corruption have reached the peak and all the societal trends are becoming more and more evil and degenerate. Look at us believers in the Lord Jesus. We believe in the Lord Jesus only in name, but in actuality, we don’t live with His word in our life at all; the churches have also become the marketplaces, trapped in desolation; many believers even pursue the evil trends, follow the worldly path, covet the glory and wealth of the world, revel in the pleasures of the flesh and feasting, living in midst of sin yet not believing it to be sin. … Such a society is far worse than that of the days of Noah. Nowadays, in the world, there are unending fights between countries and disasters happen more frequently everywhere. All these signs fulfill the prophecies of the Lord Jesus’ return. It is clear and easy to know that the time of the Lord Jesus’ return has already arrived. I had believed in the Lord Jesus for many years. Like most of the brothers and sisters in the Lord Jesus, I was waiting for the Lord Jesus’ return at every moment; especially when I saw the fulfillment of prophecies of the Lord Jesus’ return, my heart would feel eager. The Bible says: “You men of Galilee, why stand you gazing up into heaven? this same Jesus, which is taken up from you into heaven, shall so come in like manner as you have seen him go into heaven” (Acts 1:11). At that time, the Lord Jesus just left upon a white cloud; now the signs of the Lord’s return have all appeared, but why have I still not seen the Lord coming with a cloud to take us? I felt very anxious and worried, deeply fearful that I would miss the Lord’s return. Thus, I often prayed to the Lord Jesus to ask Him to lead me so that I could understand how I could better welcome His return and not cast off. These words give us a great revelation: We who believe in God must have reason. We can’t define how God works. God’s thoughts are higher than man’s thoughts. The prophecies all contain God’s wisdom and wondrousness, so they are not something we can define based on our conceptions and imaginations. There is a prophecy in the Old Testament, ‘For to us a child is born, to us a son is given: and the government shall be on his shoulder: and his name shall be called Wonderful, Counselor, The mighty God, The everlasting Father, The Prince of Peace. Of the increase of his government and peace there shall be no end, on the throne of David, and on his kingdom, to order it, and to establish it with judgment and with justice from now on even for ever. The zeal of the LORD of hosts will perform this’ (Isaiah 9:6-7). When the Pharisees studied the prophecies in the Old Testament, relying on their own imaginations, they thought when the Messiah came, He should be a king, born in the imperial palace, and of great stature, with a commanding presence and dignified and extraordinary appearance, but the result exceeded the expectations of them. When the Lord Jesus came, He was born in a manger and in the eyes of men, He was the son of a poor carpenter without great identity or high status. Because the Lord Jesus was not in accordance with their conceptions, no matter how many miracles and wonders He performed, how much truth He expressed, how profound His words were, they just didn’t accept the truth spoken by Him, much less did they acknowledge that He was the Messiah prophesied to come; they even nailed Him to the cross, becoming people who opposed God and were condemned throughout the ages. How Could I Better Welcome the Lord Jesus’ Return? • Does Anyone Know About the Second Coming of Jesus? The Bible prophecies that Lord Jesus will not only come upon a white cloud, but come in secret. So, there are two kinds of prophecies of Lord Jesus’ second coming. If the Lord does not appear to us in the image of a Jew when He comes again, then how can we recognize Him and welcome Him? Does Anyone Know About the Second Coming of Jesus?